I was at the beachfront the other day keeping an eye on this kelp gull. He was watching something in the water next to the wall and every time the wave hit the wall he flapped away like he didn't want to get wet. 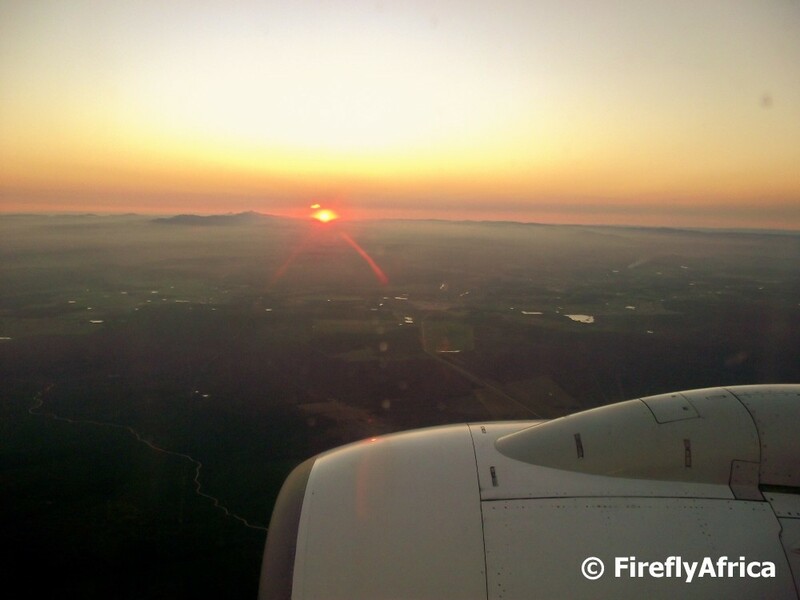 Flying home from Johannesburg a couple of weeks ago the sun set about 10 minutes before we landed as we were approaching Port Elizabeth over the Addo area. This pic was taken on the same flight I took the pics of Coega Harbour and PE Harbour from. Last Friday I posted a pic of a field of lilies taken at Settlers Park. 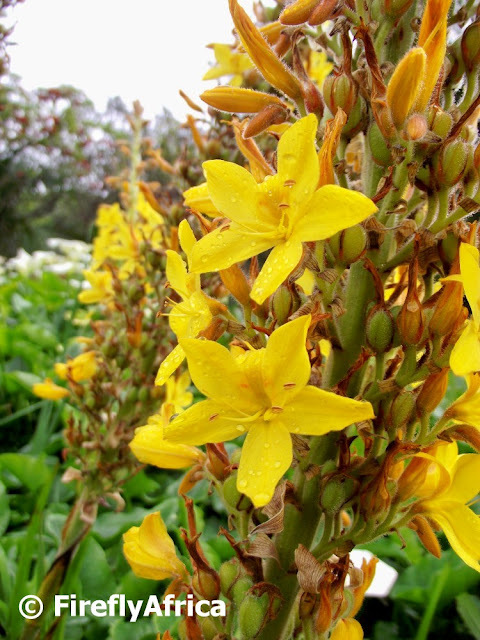 Next to the lilies were some yellow flowers and today's post shows them up close. Spring may still be wet behind the ears, but the days are getting longer and warmer and summer is a knocking on the door. This was very clear on Sunday when the temperature sored and the beachfront was packed. People seemed to have dusted off their bathing suites already and, even though the water was still a bit on the chilly side, headed to the beach. There were so much on in Port Elizabeth this past weekend that it would have been humanly impossible for one person to go to everything. On Saturday there were three fun runs, the official opening of Route 67 (I will still go and photograph all of it to post on here), the re-opening of the restored Pearson Conservatory in St George's Park (will pop by there with the camera soon as well), the city's first Gay Pride Parade (oh how I wish I had time to go and take photos there), the New Brighton Wine Festival and the Northern Arts Festival, while on Sunday it was the first Nelson Mandela Bay Urban Run (an urban obstacle coarse over 12km which I want to do myself next year). Anyway, my event of choice was the third annual Penguin Plod at Cape Recife. It was a 5 km fun walk, half of which was on the beach, hosted by SAMREC and done in aid of the fantastic work they do in the rescue and rehabilitation of the African Penguins in and around Algoa Bay. I was watching a couple of surfers at Denville's surf spot next to Kings Beach the other day. The sea was flat, and I mean pancake flat, with only the odd little wave coming through and the guys were doing a lot more waiting then actual surfing. William Moffet Express Way between Walmer and Newton Park are one of the main arterial roads of the city and is fast becoming it's automobile retail hub. Williams Hunt (General Motors) and Maritime Motors (Mercedes) have had their show rooms here for a while now and both Eastern Cape Motors (Ford and Mazda) as well as Honda had opened their show rooms along the road in the last year. Tavcor (Volkswagen) has just started construction on their new show room that will mean that most of the major car dealerships in the city would be represented on this stretch of road. 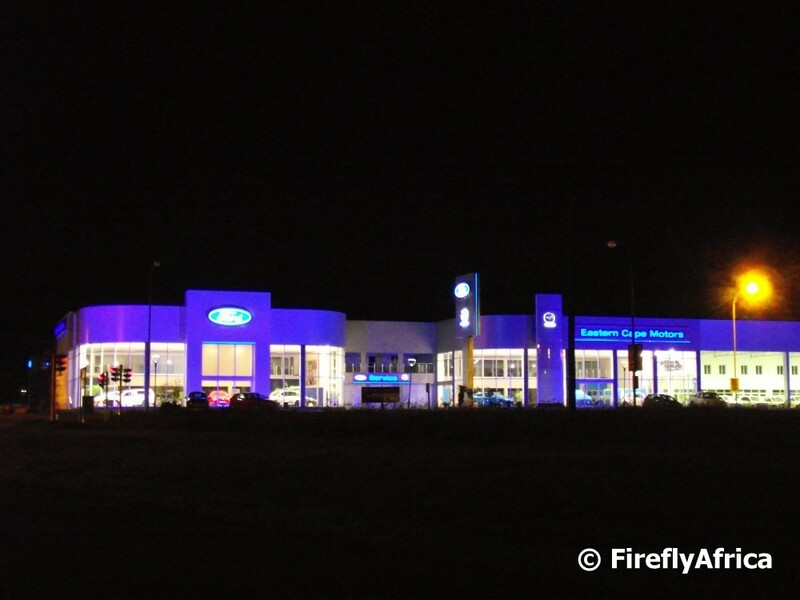 Looking at the Eastern Cape Motors dealership on my way home from a function the other night I thought two things. 1: It stands out very nicely, and 2: I don't want to know what their electricity bill is every month. 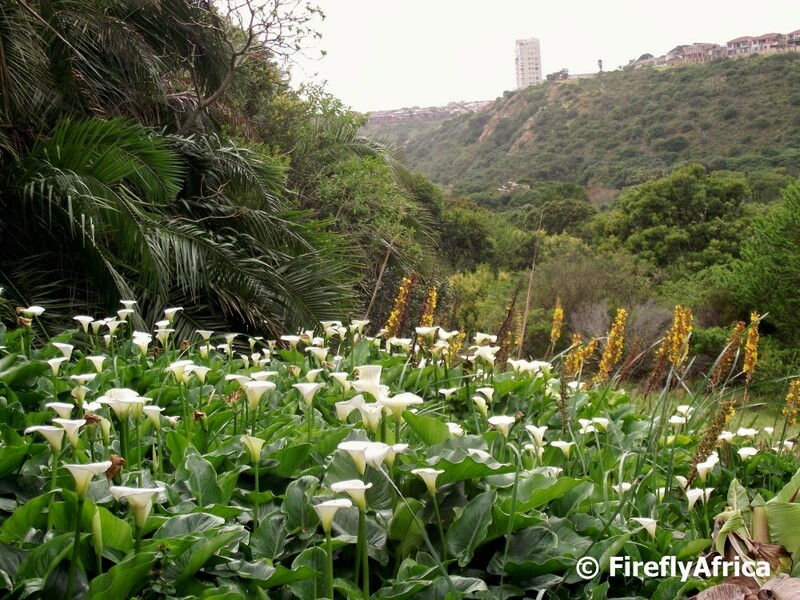 The arum lilies are in full bloom, doesn't matter if you go to Schoenmakerskop, the Baakens Valley or Settlers Park. I found these lilies just next to Settlers Park's How Avenue parking area. A couple of us from work were planning to do the lower Guinea Fowl Trail yesterday to gather information on it for our records. We decided to invite the public along and to also make it a weekly event exploring all the trails around Port Elizabeth which will also mean that I will have lots of photos on these to share with you in future. Unfortunately we rained out although we did head to the meeting place at the Settlers Park parking area off How Avenue in case somebody pitched up. I decided to stretch my legs a bit and took a walk around the parking area, discovering this old wooden walkway close by. Driving through Port Elizabeth's townships you find a number of places where meat are cooked and sold to the people right on the side of the road. These spots often become places around which the locals socialise come lunch time. The spot in the photo is situated next to the township butcher I posted yesterday. One of the pots had chicken pieces being fried in oil while the other one had meat in it. 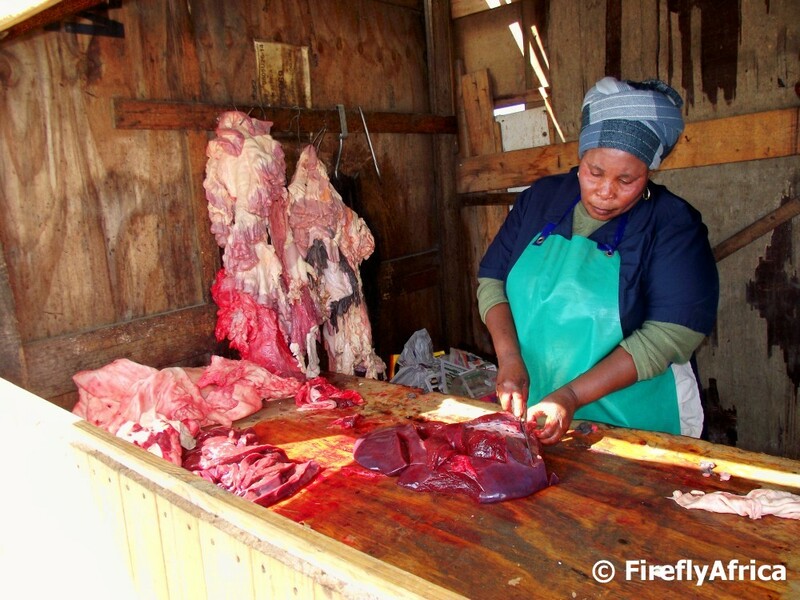 The guy was busy preparing liver while the lady was cutting fat off a cow hide. Looking back I probably should have stuck around longer and asked them questions about what they were doing, cooking and how they sell it. Next time, I promise. Most people would probably cringe when they see today's photo, but I found this scene very interesting. Across the way from the Red Location Museum in New Brighton I discovered this township butcher working from a wooden shack on the corner of the road. There was a cow head lying to the side of the "butchery" which tells me that what you see in the picture was part of a cow that was slaughtered earlier and delivered to her. As I arrived one of the locals was buying some of the liver and fat which was then wrapped in newspaper after being paid for. There wasn't time to ask her about the prices and how she measures what she sells, but I will spend a bit longer there next time I visit the township. The Red Location Museum in New Brighton was the first purpose built museum in a township in South Africa and is a tribute to the liberation struggle, specially in the Port Elizabeth townships. 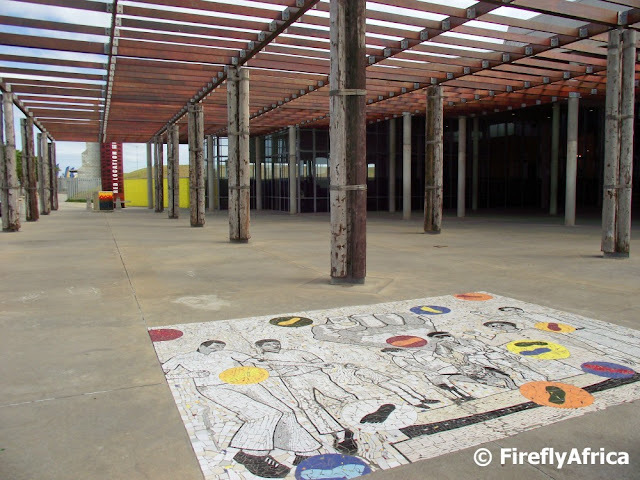 There are lots of new developments in the Red Location Museum Precinct which included the opening of the new Red Location Backpackers. I briefly visited New Brighton for a tree planting ceremony last week and really need to make a plan to get back there soon and have a look around the place again. I went to a meeting at the Prince Alfred Drill Hall the other night and on the way out snapped this pic of the lights outside the front door. 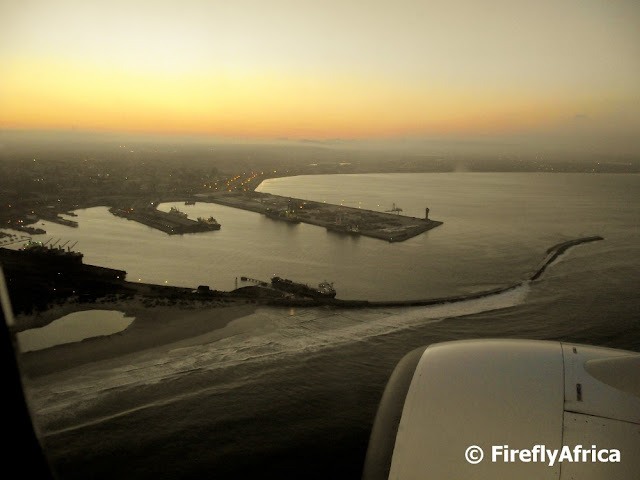 The Port Elizabeth Harbour on our approach to the Port Elizabeth Airport on my flight (I won't make the "my arms were tired" joke again) from Johannesburg last week. By now the sun had well and truly set, but I wanted to snap the photo specially for you. 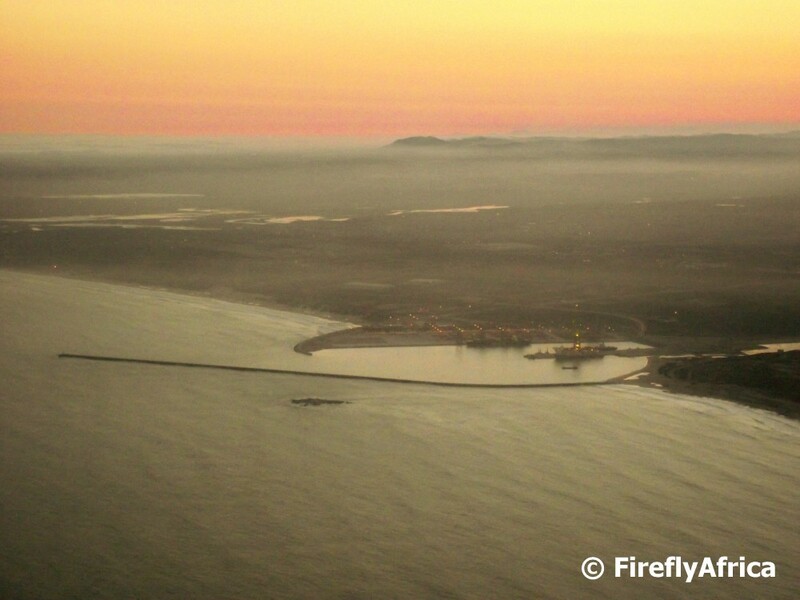 I flew back from Johannesburg last week (and boy were my arms tired) and for a change I was sitting by a window on the right side of the plane with an approach over the bay. My camera was at the ready to get a couple of aerial shots but I just about lost all light after sunset. I did manage to snap a shot of the Coega Deepwater Harbour (above) as well as the Port Elizabeth Harbour which I will post tomorrow. Yeah, yeah, I know today's picture is similar to yesterday's, but I kinda decided that I liked this one better and wanted to show you. If not today, it would have been tomorrow or next week. So today is as good as any. Won't have another one again tomorrow, I promise. 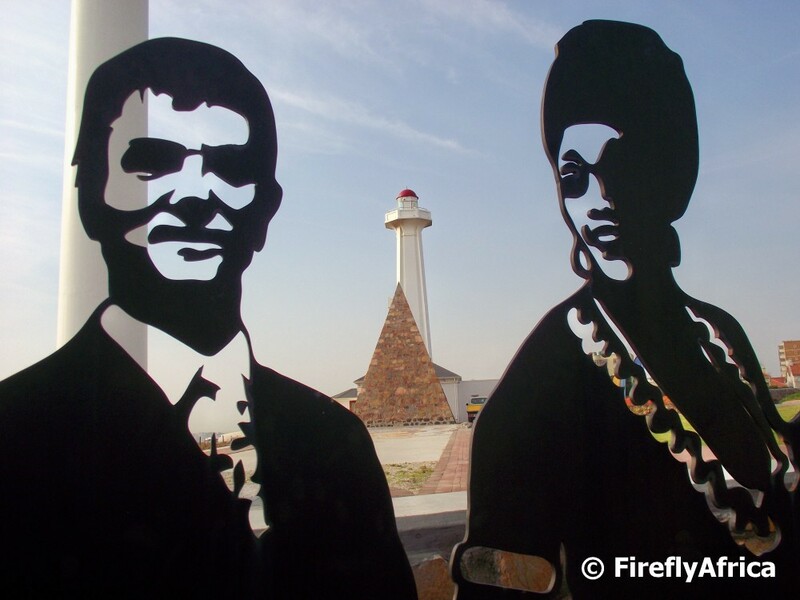 The fact that each of the figures in the Donkin Reserve Voting Line art piece is modeled on an individual person means that they make for very interesting photographic subjects. Stealth plane on the Donkin? I took a walk around the Donkin Reserve the other day to look for angles I haven't photographed before. The revamp is nearing its completion and I can't wait to head back there once all is done. Looking at this pic of the "Fish-Bird" art piece it looked like some kind of stealth plane or UFO approaching the pyramid and lighthouse. Fort Frederick in Central is the oldest building in Port Elizabeth. 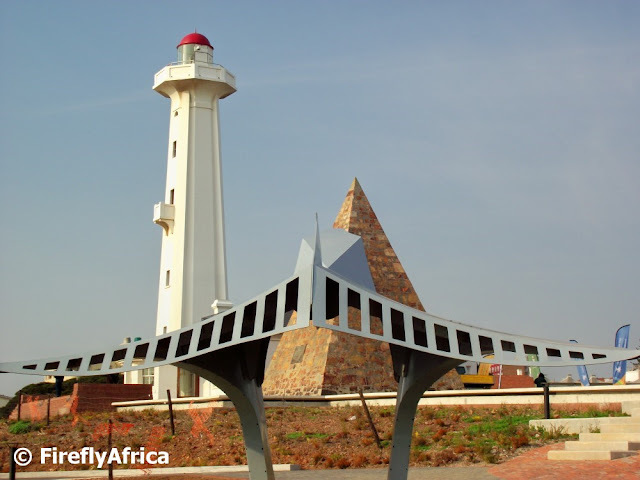 In actual fact, when it was constructed in 1799 it became the first permanent structure built by the British in Africa south of the Equator. I've heard of "No Parking" and "No Stopping" zones, but a "Kiss and Ride" zone was a first to me when I passed VW SA in Uitenhage the other day. 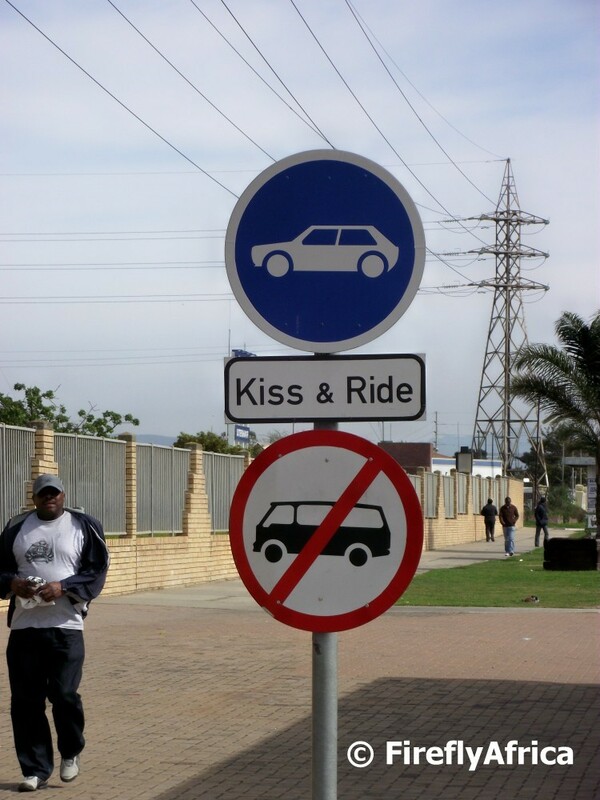 The sign is by the front entrance of the factory on a lay by which means that you stop to drop your loved one off, kiss them and go. This little stretch of beach is on the Sacramento Trail about 1,5 to 2 kilometers from Schoenmakerskop. We didn't do the whole trail on our visit, but I did find the couple standing on the lonely little beach quite intriguing. 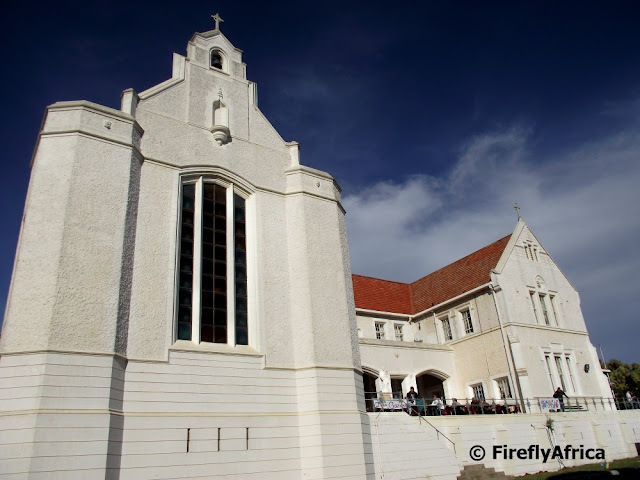 I've been trying to find the history behind St Dominic's Priory school, and in particular the building, in Mirimar here in Port Elizabeth to post with this photo of the front of the main building of the school, but seem to come up short. On St Dominic's Priory's website I did get the background history of the school, but not the building. The following is quoted of their website: In 1867 six foundresses left Sion Hill, Dublin, and set sail for a missionary station in Port Elizabeth, South Africa. They established the Holy Rosary Convent there. Two other Catholic schools were also established in Port Elizabeth in the following years: Marist Brothers College for boys (started by the Marist Brothers) and Saint Dominic’s Priory (started by the Cabra Dominican Sisters). Holy Rosary Convent, Marist Brothers College and Priory High then merged to form Trinity High School – for boys and girls. A Junior School continued to exist at the Priory. 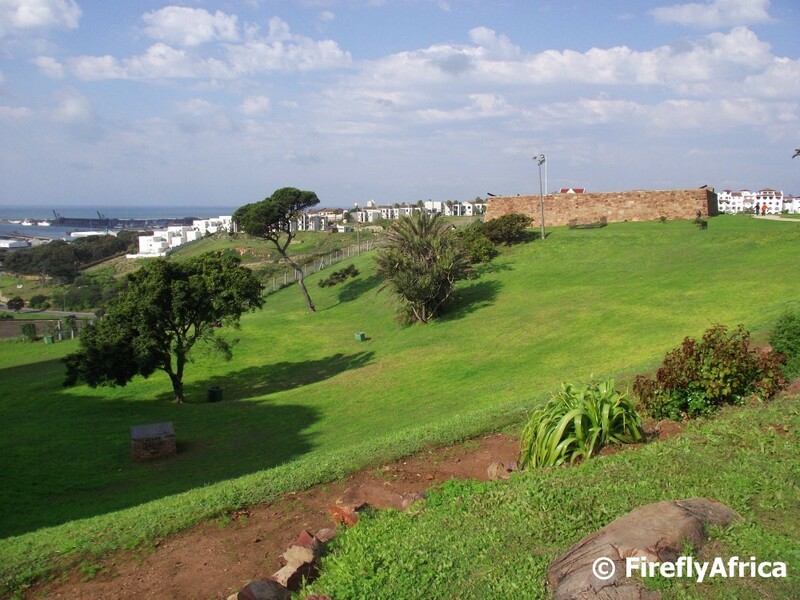 They took up residence in the Holy Rosary Convent buildings in Central, Port Elizabeth. Urban decline and economic factors resulted in this hopeful venture being reassessed and a move to Priory being undertaken in 2000. The Holy Rosary buildings were sold. The riverside suburb of Amsterdamhoek on the banks of the Swartkops river, named after a Dutch ship (Amsterdam) that sank off the river mouth in 1817. 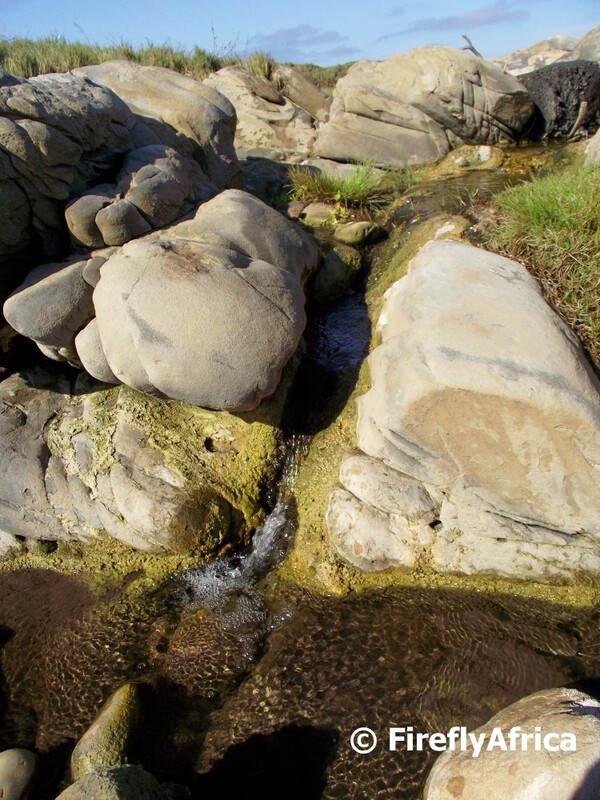 When walking along the coast line at Schoenmakerskop you see a number of fresh water streams, emanating from springs between the rocks and vegetated dunes, flowing down towards the sea. This particular one flows right below the Sacramento wreck monument about one kilometers from along the trail from the cannon. Visitors from out of town are usually very intrigued with the front view of the St Mary's Anglican Church in the Port Elizabeth city centre. 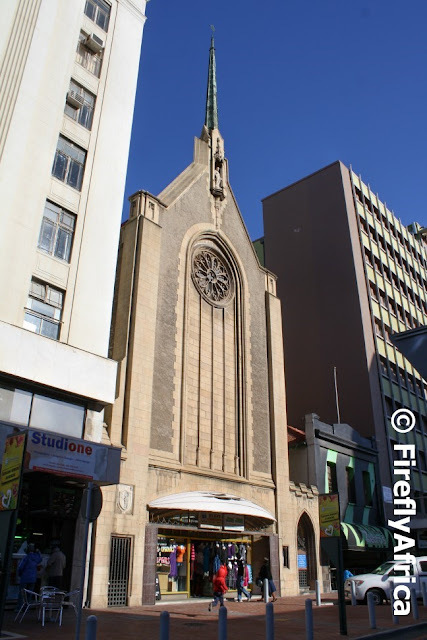 If you go up the side road you will see the whole side and back of the church, but from the Govan Mbeki Avenue (Main Street) side it looks like the church is wedged between a couple of high rise buildings. The Farriagers Restaurant is the in-house restaurant at the Kelway Hotel in Port Elizabeth. Seating is both outside on the deck as well as inside in the restaurant area and the menu covers quite a wide range of food along with a number of very good wines. I had a fantastic meal there with the family the other night of which you can read the review on The Firefly Photo Files. 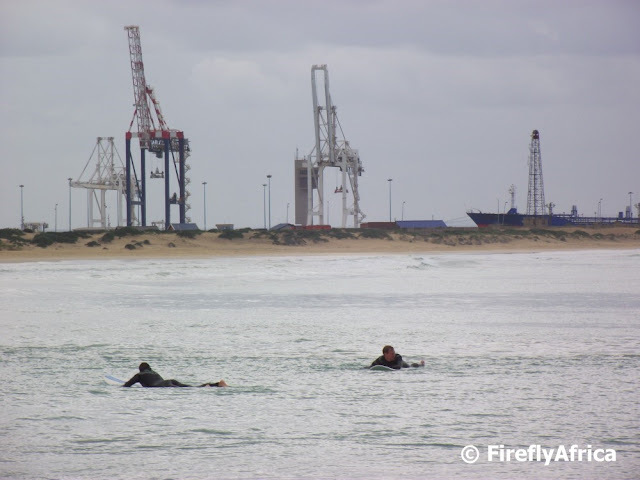 Millerslocal is a fantastic website for all surf related aspects of Port Elizabeth and, although I've never surfed in my life, I often pop over to have a look at some of the surf pics the guys post on there. 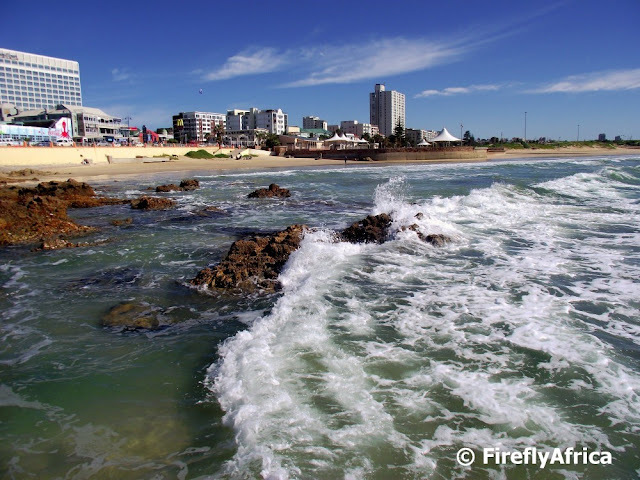 Not to long ago they had a couple of posts on where Port Elizabeth's surf spots got their names from and I had the idea to go and take a photo of each one and post it here on PEDP. I haven't actually been around to go take the photos, but snapped this one for a start the other day. 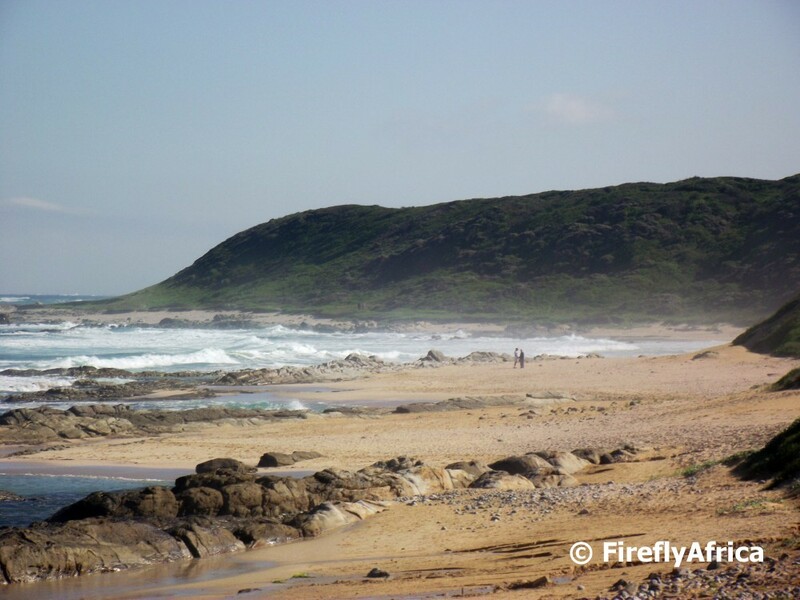 The little bay next to McArthur swimming pool is called Denville's and is a favoured spot with beginners and surf schools. The name came from a couple of dudes that used to surf here around the 60's, Dennis Buchman and Neville Mandy. 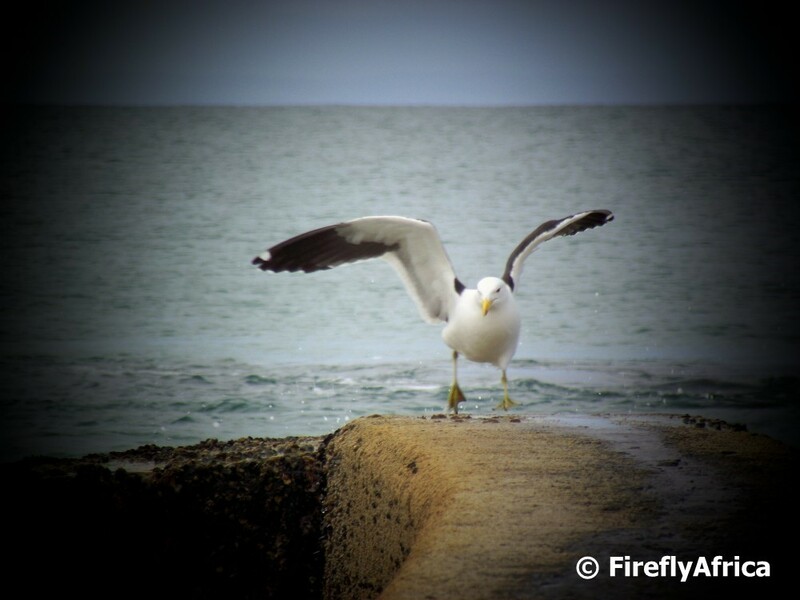 Hi, I’m Jonker Fourie (known online as Firefly) from Port Elizabeth Daily Photo in Port Elizabeth. Port Elizabeth IS BEST KNOWN FOR its friendly people, beau­ti­ful beaches and coast­line, game reserves on our door­step, diverse his­tory and unfor­tu­nately... the wind, which isn’t any­where as bad as people like to make it out to be. GET YOUR PICTURE TAKEN AT with a lion cub at Seaview Game and Lion Park or chee­tah at Kragga Kamma Game Park. 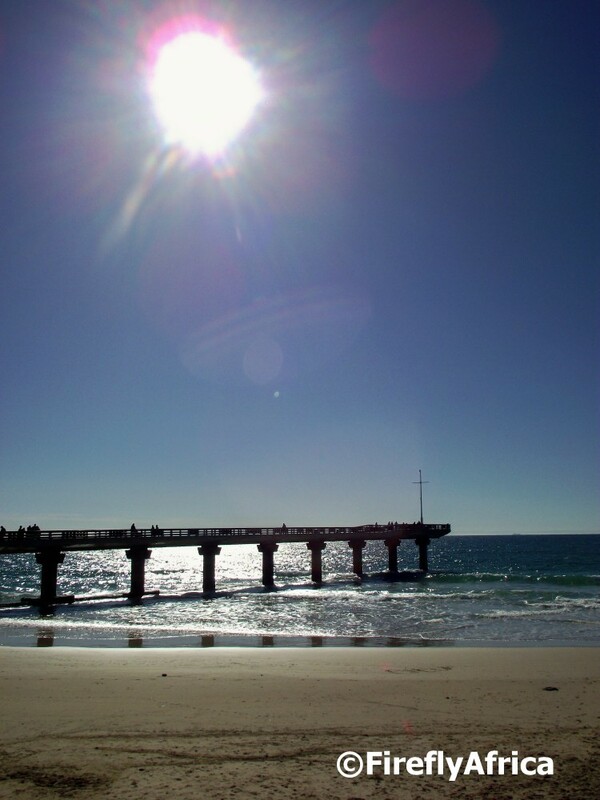 THE BEST sun­rise PICTURES CAN BE TAKEN AT Shark Rocks Pier or on the Donkin Reserve. OTHER HAPPY SNAPS AT Sardinia Bay, Maitlands or around the his­toric build­ings on the Donkin Heritage Trail. Check out PE Daily Photo for lots of happy snaps ideas. WHEN THE WEATHER'S GOOD, I LIKE TO head out to Addo Elephant National Park or Kragga Kamma Game Park for some game view­ing. Doing a short hik­ing trail is also a good idea. WHEN THE WEATHER'S BAD, I LIKE TO browse the shops in Walmer Park or Greenacres Shopping Centres (at a lack of a bet­ter answer than stay in and play my son’s PS2). I THINK THE BEST TIME OF YEAR TO VISIT IS in autumn (March to June), BECAUSE the weather is stun­ning and there is very little wind. MY FAVOURITE BREAKFAST SPOT IS with my gas bottle and skot­tel at sun­rise on the beach­front teas­ing early morn­ing walk­ers with mouth water­ing smells. 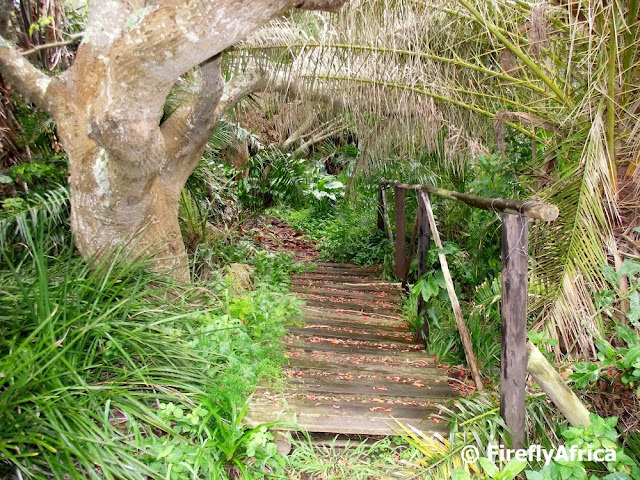 Otherwise on one of the wooden access board­walks on Lovers’ Lane across the road from the Protea Hotel Marine. FOR LUNCH, I SUGGEST Sacramento Restaurant in Schoenmakerskop after a walk on the Sacramento Trail. 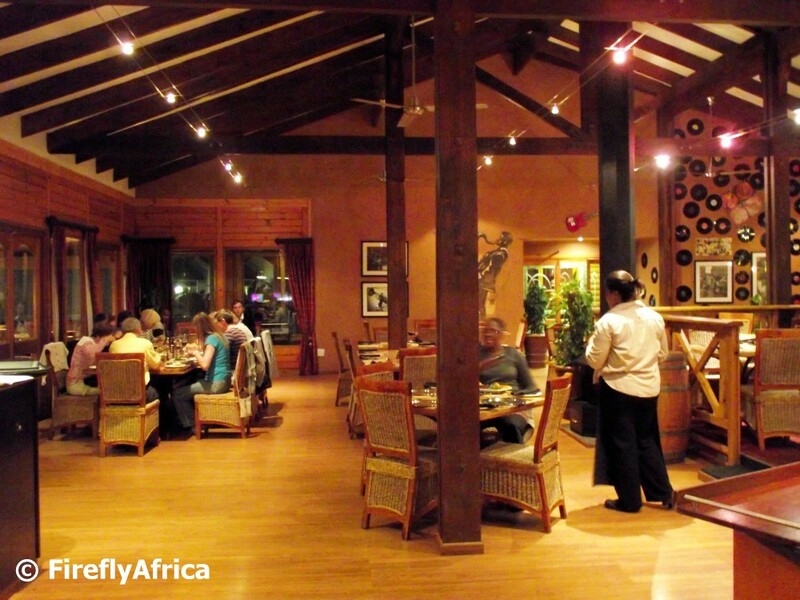 MY FAVOURITE RESTAURANT IS Farriagers Restaurant at the Kelway Hotel, TRY THE Wild Africa Cream and chocol­ate chip cheesecake. BEST LATE NIGHT SNACK FROM my fridge but I don’t think the ladies at Weighless will approve me hav­ing a late night snack. Sorry, the Rugrats are still small and we don’t really get out late much. 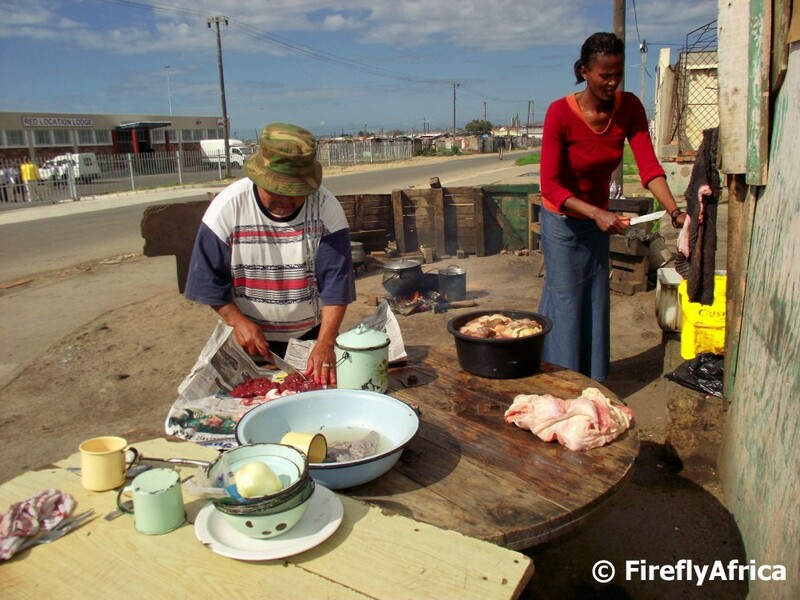 Saying the fridge beats say­ing the 24 hour Steers. MY FAVOURITE ice cream SPOT IS the Red Windmill at Hobie Beach and walk­ing on the pier lick­ing away before it melts. FOR A NIGHT OUT ON THE TOWN TRY one of the res­taur­ants and eat­er­ies in Richmond Hill. 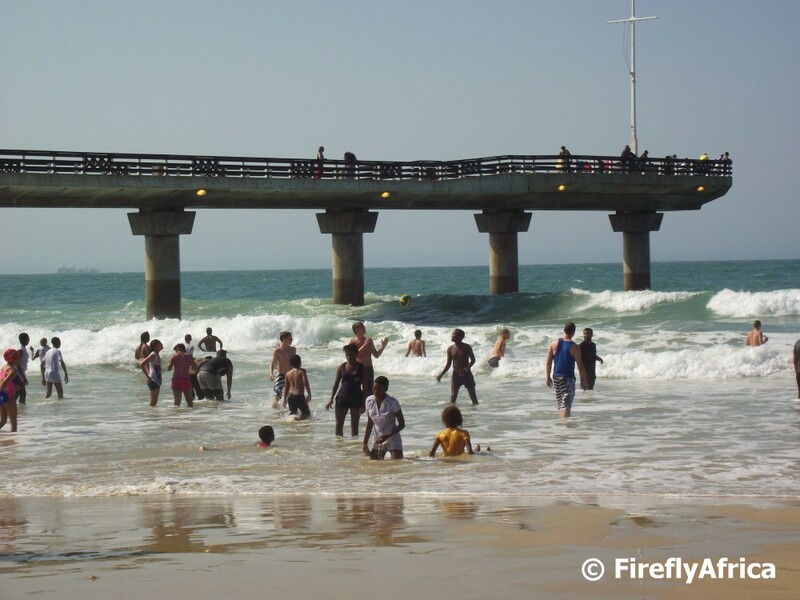 IF YOU WANT TO MEET LOCALS, GO TO The Boardwalk Casino and Entertainment Complex on the beachfront. 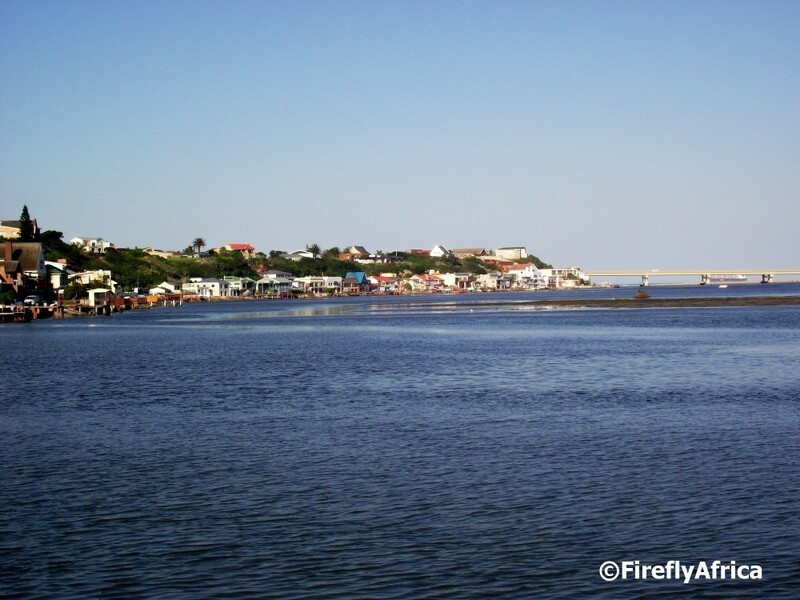 Port Elizabeth’s BEST KEPT SECRET IS cruis­ing on the Sundays River Ferry and dis­em­bark­ing near the river mouth before climb­ing to the top of the sand dunes for a mag­ni­fi­cent view across Algoa Bay back towards the city. MY FAVOURITE THING TO DO WITH FRIENDS IS to go and show them some­thing around town that they haven’t been to. FOR SOME LIVE MUSIC, I LIKE TO GO TO a Centrestage music per­form­ance. TO RELAX AND RESTORE MY SOUL, I LIKE TO take a stroll along one of the hik­ing trails (nat­ural or her­it­age) around town. I also like to explore the city’s his­toric cemeter­ies, but that’s just me. 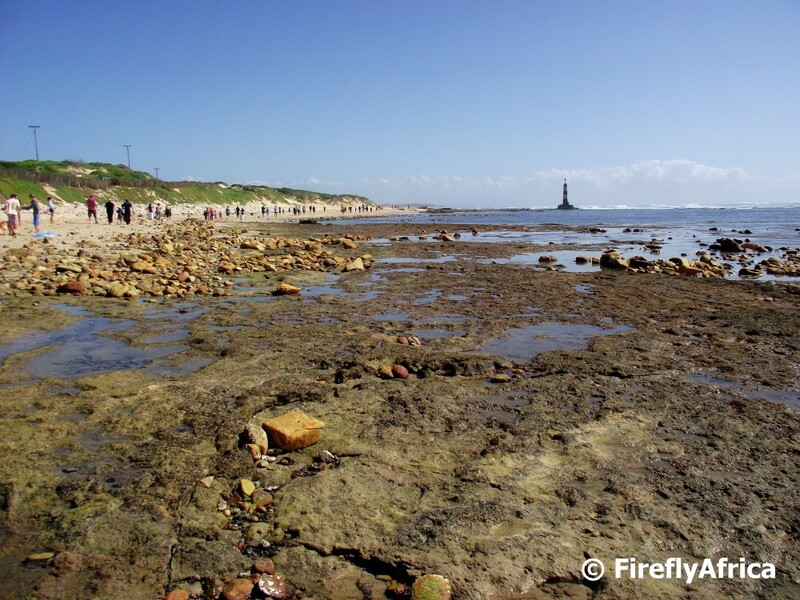 IF YOU'RE FEELING ADVENTUROUS, TRY scuba diving one of the numer­ous dive sites around Algoa Bay or on the Wildside. MY FAVOURITE DRIVE IS the Sunshine Saunter start­ing off along Marine Drive via Schoenmakerskop and Sardinia Bay to Maitland. MY FAVOURITE farm SHOP IS the Nanaga Farmstall for its awe­some pies and roosterkoek. 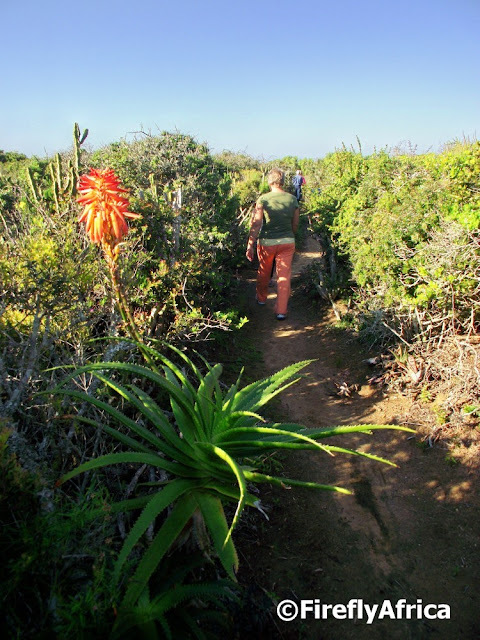 MY FAVOURITE flower and bird WATCHING SPOT IS Van Stadens Wildflower Reserve or Fynbos Trail in Schoenies. IF YOU'RE HERE IN early December, JOIN IN THE FUN AT the Nelson Mandela Bay Stadium for the SA leg of the Rugby 7’s World Series or Ironman South Africa on the beach­front in April. MY FAVOURITE MUSEUM IS the Port Elizabeth Museum at Bayworld. CHECK OUT THE dino­saur, ship­wreck and mar­ine exhibits. MY FAVOURITE BUILDING IS the old Public Library, FOR ITS beau­ti­ful facade, interior with lots of good child­hood memor­ies and stained glass windows. TRAVELLING WITH CHILDREN? A FUN OUTING IS vis­it­ing the SAMREC pen­guin rehab­il­it­a­tion centre at Cape Recife. BEST CHEAP AND CHEERFUL OUTING IS climb­ing the ginorm­ous sand dune at Maitland River Mouth with a piece of hard­board or card­board and slid­ing back down. WHEN MONEY'S NO OBJECT, I LIKE TO spend a relax­ing / romantic week­end at one of the private game reserves near Port Elizabeth *pop* — My bubble bursting. THE MOST UNUSUAL THING I SEE HERE IS how sur­prised people are when they real­ise how much Port Elizabeth actu­ally has to offer visitors. MY FAVOURITE WEEKEND GETAWAY IS out­side Port Elizabeth is camp­ing at Sleepy Hollow, but because PE is such an ideally situ­ated city, week­ends away from the city can also be taken in the Tsitsikamma, St Francis Bay, Jeffreys Bay, the Baviaanskloof, the Karoo, the Sunshine Coast or even in Hogsback. WHEN I WANT TO GIVE BACK TO THE COMMUNITY, I donate blood. Ok, so I’m not as involved in the com­munity as I should be. A good option is to approach a local tour oper­ator and sup­port one of the town­ship causes that they are involved in. I ♥ Port Elizabeth BECAUSE it may be a city with all the big city amen­it­ies, but its still a town at heart. 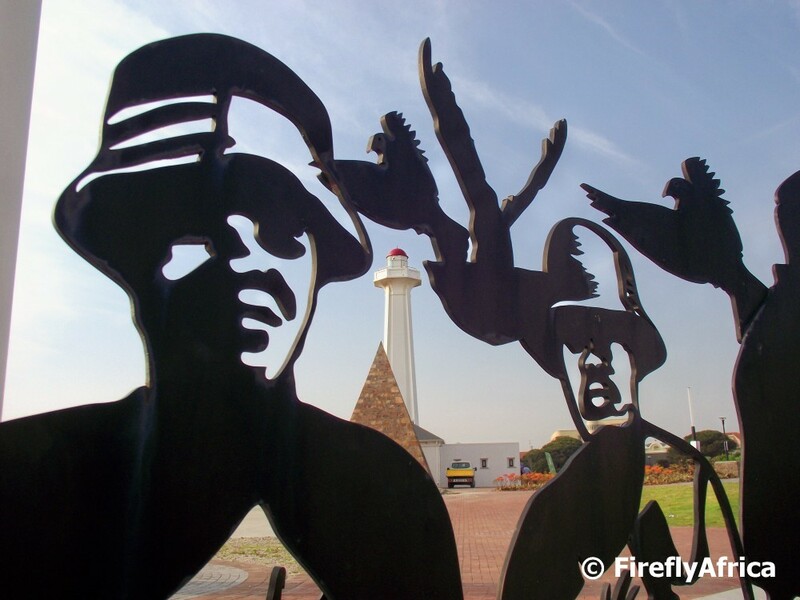 PE may not have big “must see” attrac­tions but there are count­less places, museums, gal­ler­ies, nature reserves, beaches, his­toric attrac­tions and more to dis­cover and keep one busy for days at end. 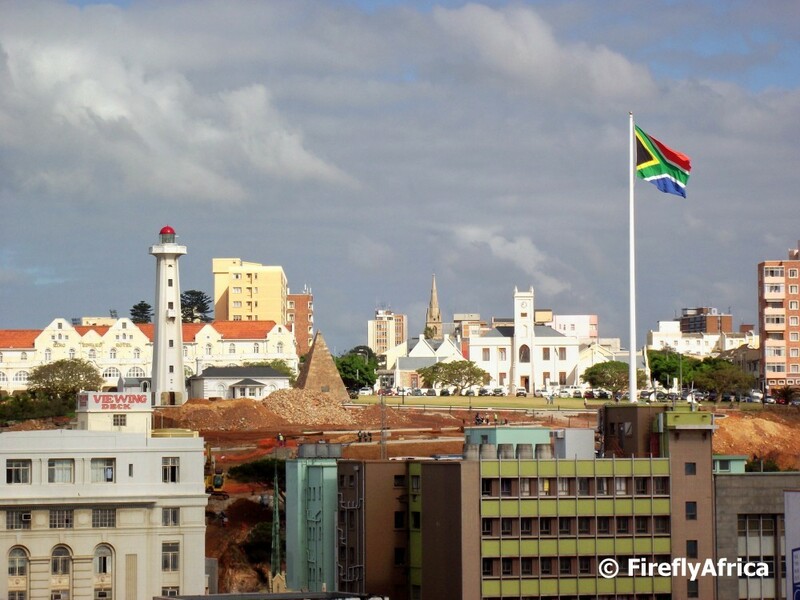 Looking towards the Donkin Reserve from the viewing deck at the top of the Campanile one can clearly see how big the South African flag flying up there is. 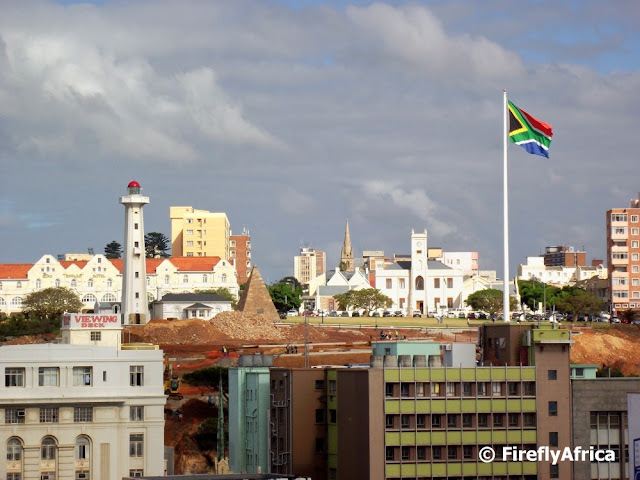 The Donkin Lighthouse and Pyramid can be seen on the left with the King Edward Hotel and the Grey Institute next to it. Today is 1 September which means it is Spring Day. The winter is over. Well, kind of. Although its still some way to go to summer, the days are getting longer and a little less cold. So I went through my unposted pics to find something suitable for today's post and found ... no flower pictures at all. So we will have to celebrate Spring Day with an aloe flowering on the Aloe Trail out at Bluewater Bay.